September’s edition of Cosmopolitan magazine (yes, September already!) features two of our favourite i-glamour products. With the gorgeous Isla Fisher on the cover, Cosmopolitan imparts great hair advice as per usual. The Silver Bullet Nano Ceramic Root Volumiser Hair Crimper features as “cool stuff to get your strands looking lovely”. As Cosmopolitan says, the Silver Bullet Nano Ceramic Root Volumiser Hair Crimper “crimps under layers at the roots for volumised hair that lasts til you wash”. It’s the simple and easy way to add oomph to your roots to prevent your hair falling flat. No damaging backcombing or teasing needed! Win! 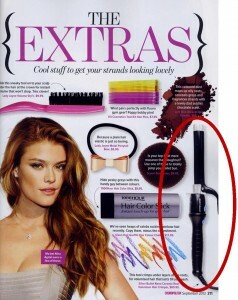 The Spornette G36 Radial Brush also makes an appearance in September’s Cosmopolitan magazine. For a good blowdry for a bob hairstyle, or shorter hair in general, you need a large barrel brush. Jonothon Malone, stylist, says “There’s a fine line between mumsy and cool when it comes to bobs”. Hence, the need to sass your style up a little with mousse and a Spornette G36 Radial Brush. The mix of natural boar and nylon bristles grabs the hair to really allow you to control and smooth the hair while blowdrying. It’s your blowdry’s new best friend!